Ringgold Elementary 5th grade students and staff gathered to give Our HERO- Pfc. 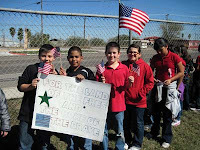 Ira "Ben" Laningham a final salute as he passed in front of the school in Rio Grande City. PFC Laningham was to have his final resting place at the Rio Grande Valley State Veterans Cemetary.